next article Making dinner or eating out? 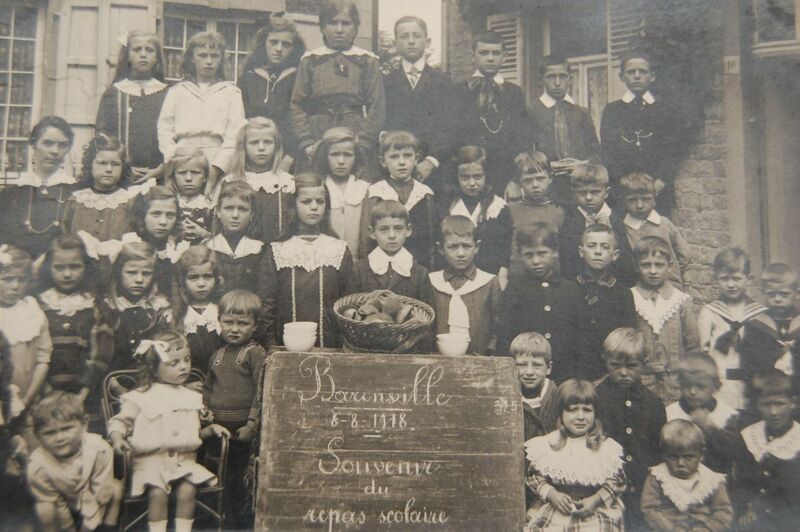 Set up on 6 August 1914 by the National Relief and Food Committee, the School Soup programme defended the importance of free food for all Belgian children between the ages of 2 and 17 years. School year, Christmas vacations, Sundays, public holidays! 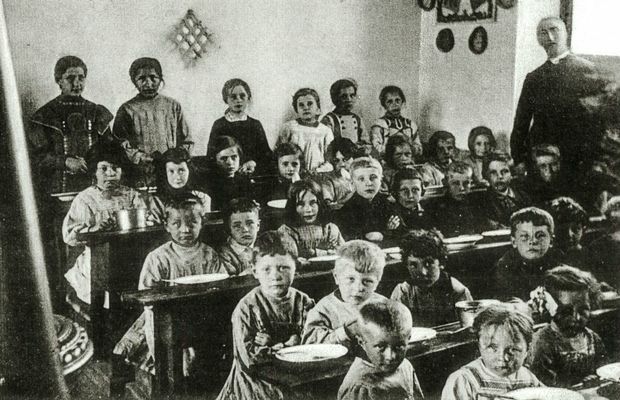 The soup was prepared incessantly, and Belgian families knew that at least once each day, their children would be properly fed at school. A bowl of soup, some bread and a beverage selected and prepared by employees or volunteers, were served to the children gathered around the table, even as the world was fighting around them. During the long years of the conflict, the enjoyment of a hot bowl of soup with vegetables, a little animal fat as recommended by the medical authorities and a touch of meat provides children with some comfort. The "biscuits" and "snacks" aisles at a modern grocery store offer a vast range of products intended for children. Choices are not guided solely by nutritional reasons, but often by brand and packaging strategies that, for example, present media personalities with which the children can identify. This type of consumption oscillates between quantity and quality, and that's a reality outside of daily concerns during periods of uncertainty. 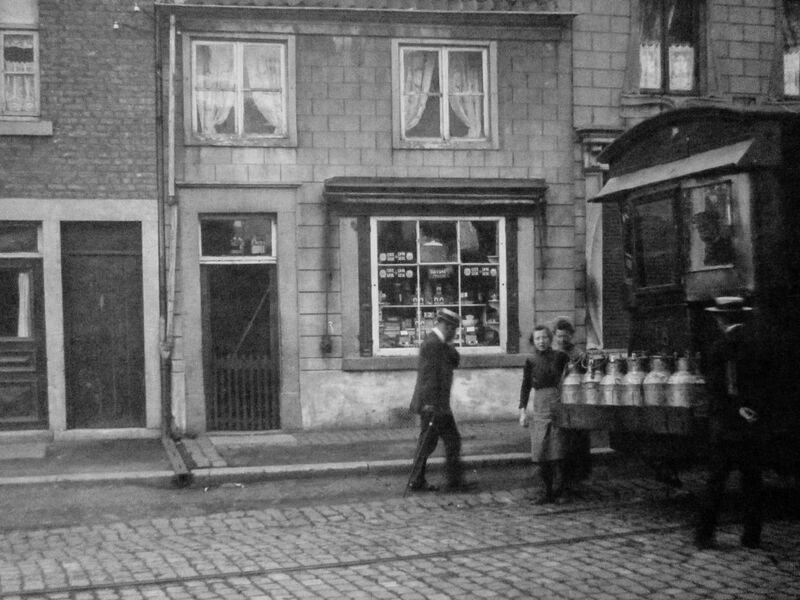 This is the case in the early part of the 20th century in Western Europe, when the food industry and the consolidation of brands are barely getting underway. 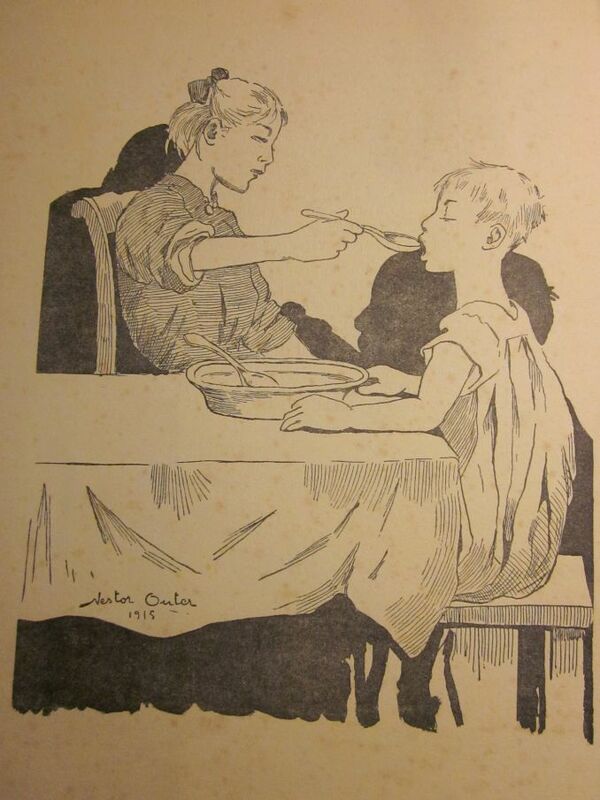 During the period of the Great War, as is the case with most conflicts affecting society, the feeding of the young generations is one of the great concerns. 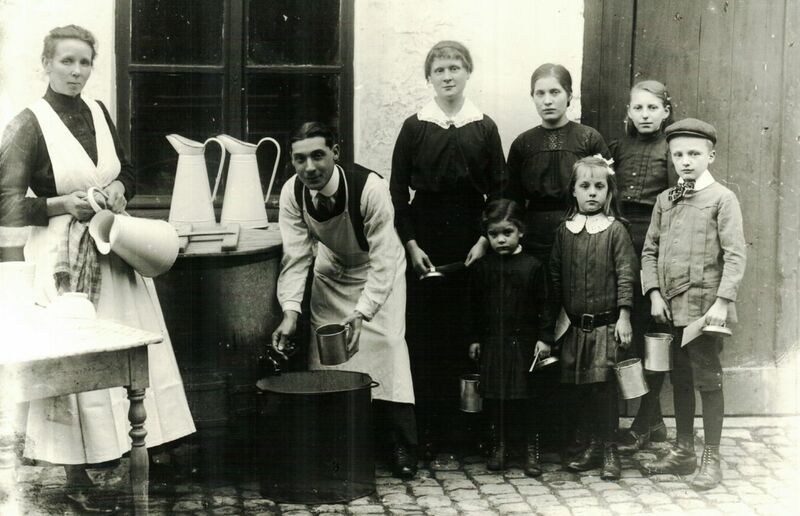 In Belgium, in the aftermath of the German occupation, the CNSA (National Relief and Food Committee) promoted adaptations of the programme known as the School Soup in the various regions of the country. The principle was simple: distributing soup and bread to students of the communal schools, private schools and, in general, needy children from the country's cities and villages. This idea is even conveyed in a poem from Luxembourg Province in 1915, "Petits enfants priez d’abord, Puis devant l’assiette fumante, Que vous sert une main charmante, Montrez que l’appétit est fort. Ne craignez rien, on remplira, Votre écuelle tout entière, Sitôt qu’elle se videra, De Soupe Scolaire". (Little children, say your prayers, Then in front of the steaming plate, served to you by a charming hand, Show that your appetite is strong. Have no fear, it will be filled, Your whole bowl, As soon as it empties, with School Soup). For child discovering, at the time, a world with daily life in upheaval and changing very rapidly, the ability to sit at the table at school and receive a bowl filled with a good hot soup brought comfort that was both moral and nutritional. 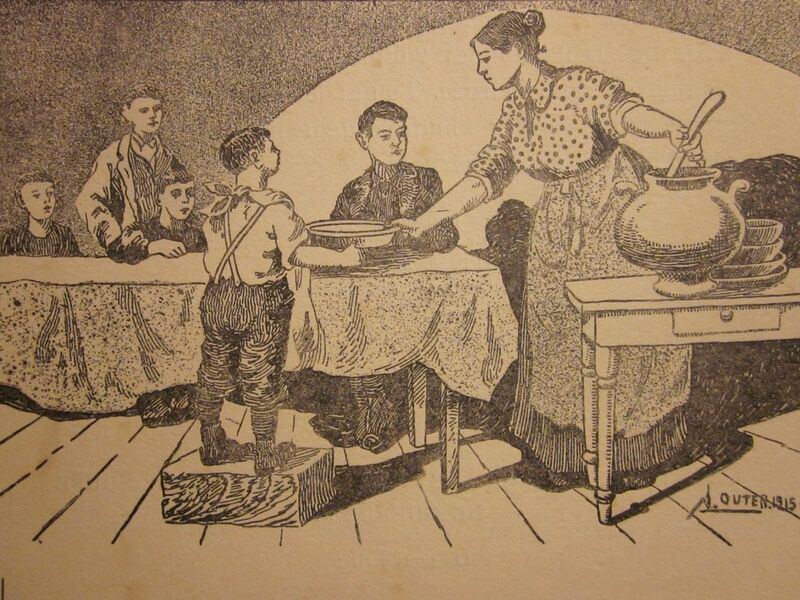 From simple schoolchildren to the young girls in normal schools and including the children of soldiers called up to serve, all received this School Soup. 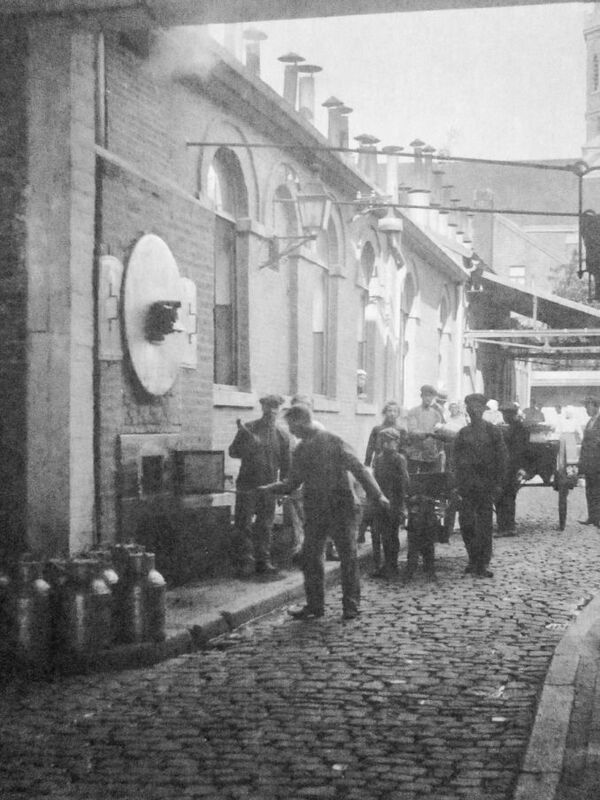 This operation was carried out both by national and local organisations, such as the Comité des Aides et Protection aux oeuvres de l’enfance, the Commission d’Alimentation de l’Enfance, the Oeuvre Nationale des Orphelins de la Guerre, les Petites Abeilles and the Oeuvre des Femmes Bruxelloises as well as the Comité Arlonais de Secours aux Sinistrés. "No more sick children since that darned soup"
The work of these organisations, i.e. preparing and distributing litres of good soup, depended on the available products, access to a transportation network, the number of children having to be fed and, especially, the existence – or capacity – of the kitchens found in the schools. 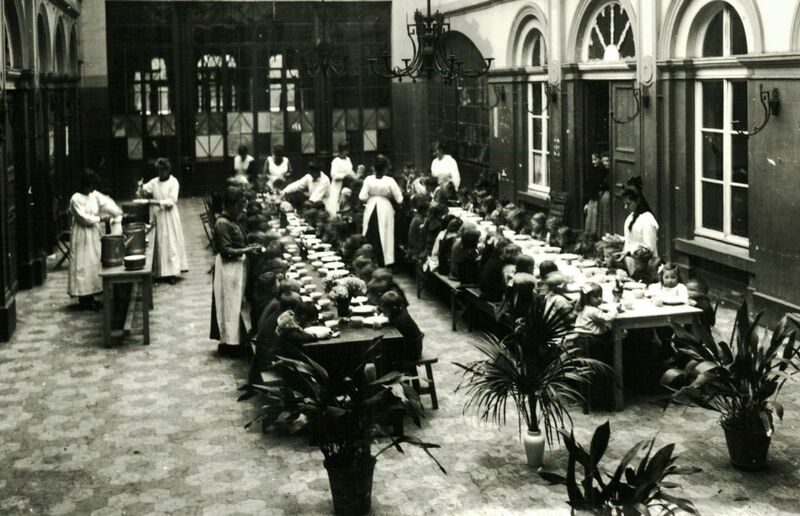 While the nuns at the Etalle home economics school were known for preparing a particularly good soup when compared with all of the schools in the village that also prepared soups, the City of Brussels implemented a preparation intended for schools in the city and regions, such as the suburbs of Auderghem, Etterbeek, Evere, Schaerbeek, St-Josse-ten-Noode, Tervuren and Woluwe-St-Lambert. In the Brussels region, the soup's preparation begins at 2 o'clock in the morning, when the vegetables and meat cut up the previous evening are mixed with the other ingredients in the boiling water. Everything simmers until 7:30 AM, at which point the stoves are turned off. The soup is then poured into containers that crisscross the city, extending as far as the furthest reaches of the region. The choice and diversity was limited by certain often rare ingredients, such as good quality meat, or inaccessible ingredients such as potatoes, in the big cities during certain moments of the conflict. The differences in the taste of the soup distributed in the capital and in the country's other regions was strongly dependent on the local products and the access to them. 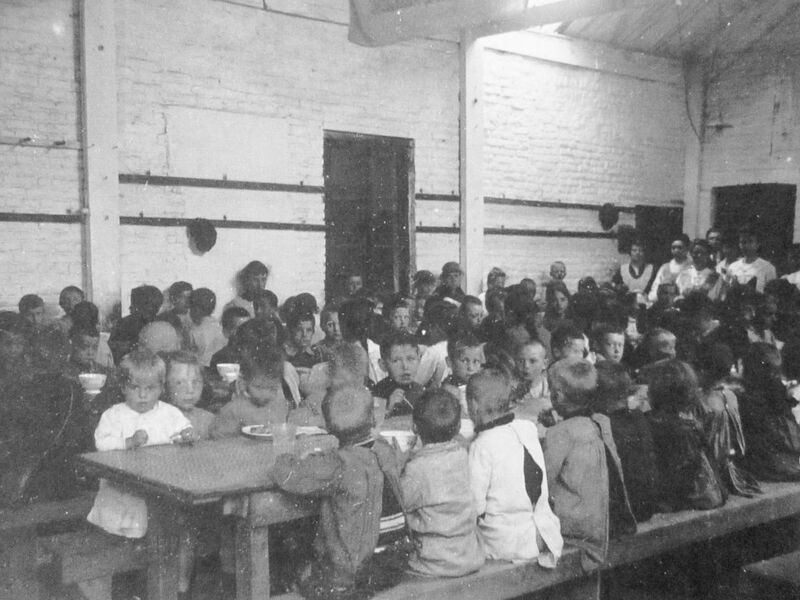 In villages such as Virton-Saint-Mard, each child received a daily ration of meat with the soup, which was not the case in the big cities. The shopping list for the city of Halanzy included Italian noodles and Maggi powder for seasoning; for the large quantities of soup in the cities, the taste only resulted from vegetables, onions and salt. 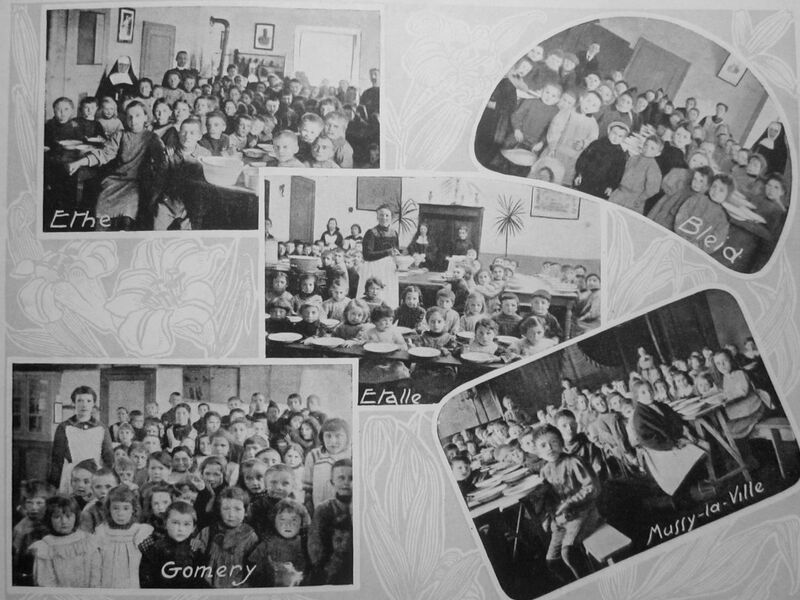 In Musson, Ethe and Saint-Remy, each child received apples or pears for dessert, a detail missing from the urban menus. 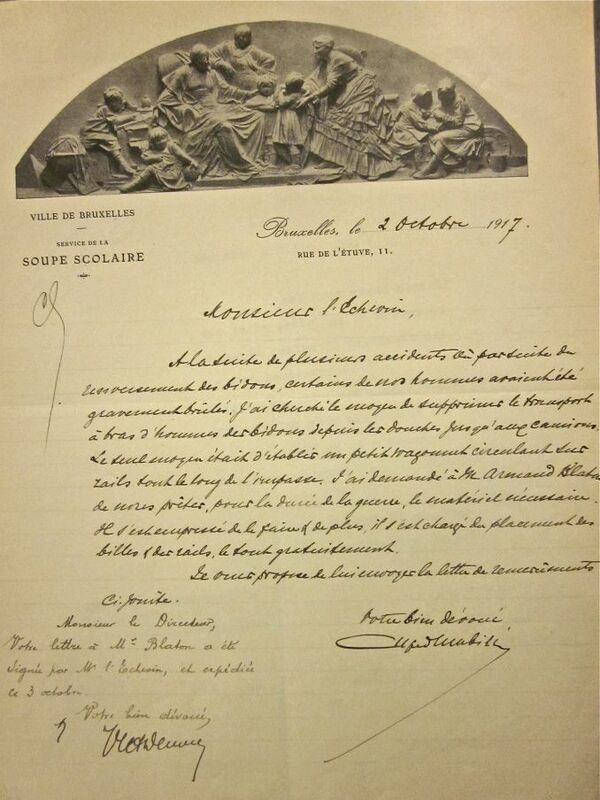 In Latour, even the women working in the fields were entitled to free soup. In the Brussels region, the ingredients of the soups depended on the day. 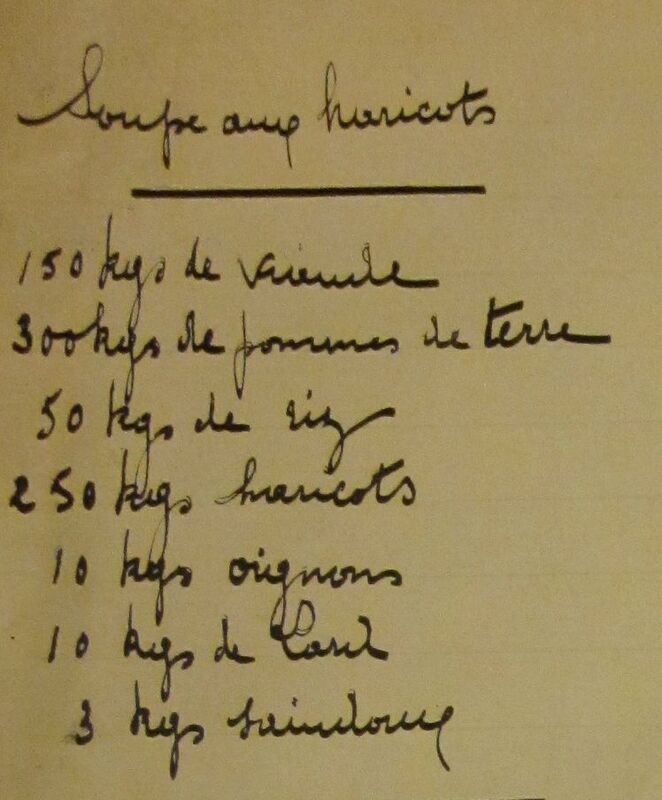 For example, the Monday soup in September 1915 was bean soup. Soups made of green beans, leaks, rice, herbs, celery, onions and lentils constituted the basis of the sample for the weekly possibilities. Bacon, onions, a bit of meat, some rice, lard, potatoes (often) and salt provided the basis for the taste of most of the School Soups. Unlike today, the children couldn't choose according to their preferences. The 1914-1918 period was characterized by nutritional menus that depended on the war-related choices: seasonality of the products, ease of finding the necessary quantities and the budget intended for this purpose (or, with a bit of luck, the number of donations). Unlike today, the children couldn't choose according to their preferences. 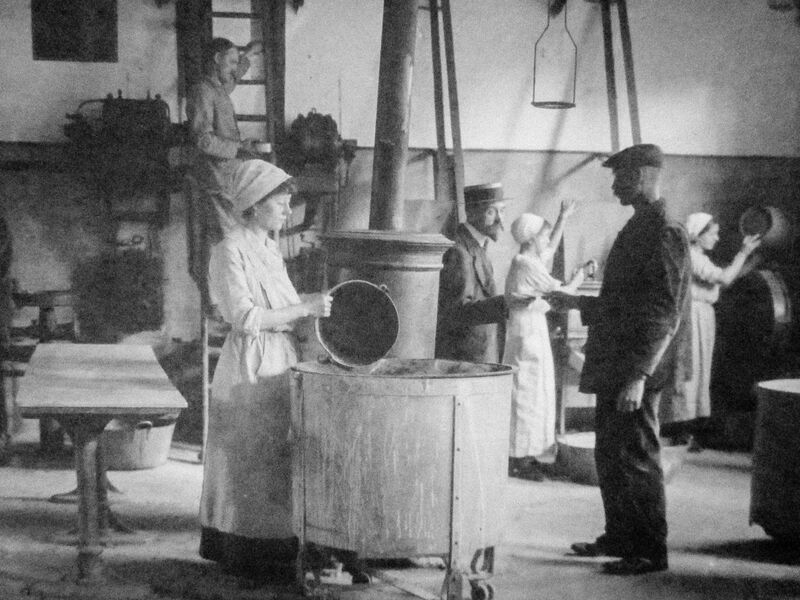 The 1914-1918 period was characterized by nutritional menus that depended on the war-related choices. The one third of a litre authorised for distribution per child and per day was often the only meal of good nutritional quality that a child would receive that day. It should also be recalled that, upon arriving at school in the morning, they were also provided with a "couque" - a kind of bread with a different name in each of the country's regions – at no cost! This is often the result of donations and fractions of taxes intended to help children. One of the major differences in the no-cost aspect of this service between the cities and the countryside was notably the need to monitor the distributed quantities and the number of beneficiary children. The images showing the children around the table give an idea of how this programme had an impact not only on the children, but also on the personnel managing the preparation and distribution. 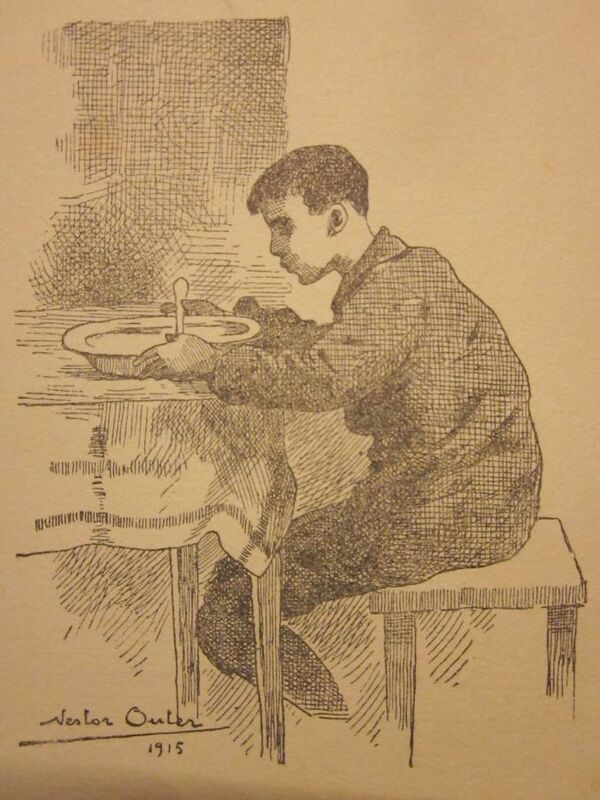 When thinking about this School Soup distributed during the war – even on weekends and vacations – it's clear that over and above these simple dishes and spoons, there is a true symbol of community, and that this soup constitutes one of the oldest nutritional preparations in the history of man: that of conviviality. 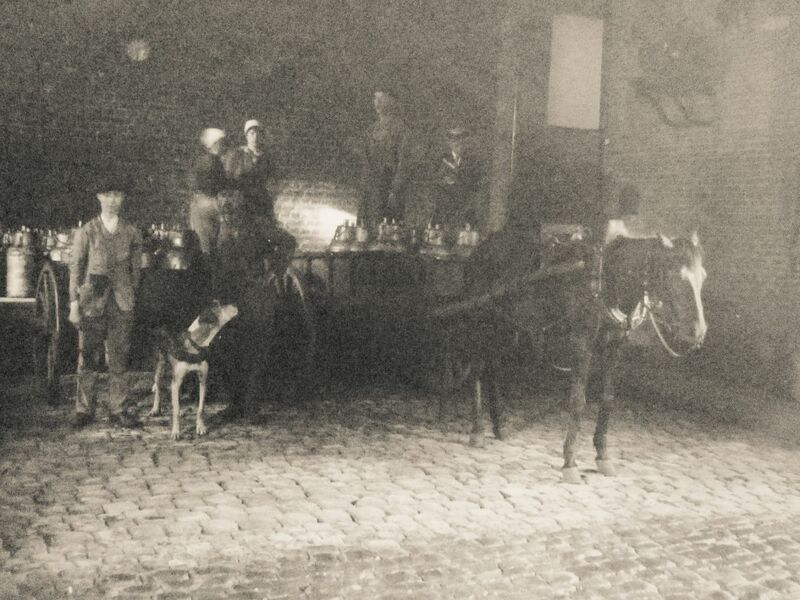 Certainly one of the most pronounced souvenirs of the collective memory of Belgian childhood during the First World War. DELHALLE, S. (2012). 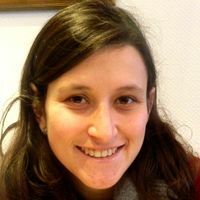 "Le CNSA, œuvre purement humanitaire ? 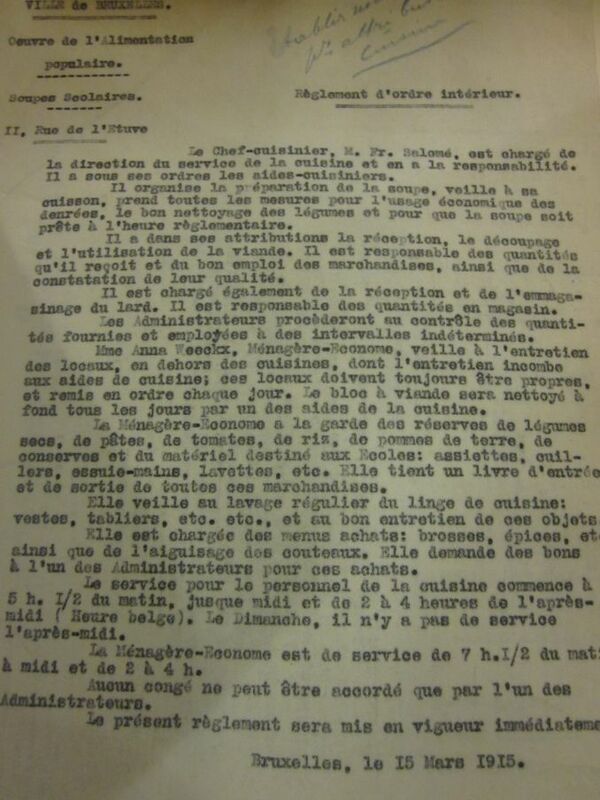 Les comités locaux de Secours et d’Alimentation pendant la Grande Guerre." Online http://www.ihoes.be/publications_en_ligne.php?action=lire&id=117&ordre=nouveau, consulted in March 2014.